I got Andoer C5 Pro as it is the cheapest native (real) 4K Action Camera available. Don’t get irritated, there are many cameras labelled “4K” but only offer interpolated 4K resolution. On interpolated 4K action cameras the video is recorded in a lower resolution than 4K and upscaled to achieve a 4K output. If you want some more insight, read my tutorial real vs fake 4K. Andoer C5 Pro uses the 12 MP Sony Sensor (IMX117), found in many action cameras, including GoPro Hero 4 black. Which is the Ambarella A12, which can be found in the latest native 4K action cameras, such as SJCAM SJ7 Star or Eken H8 Pro. This is just an overview, you can find all available resolutions and modes in the settings section of this article. is available up to 16MP, which is upscaled as 12 MP is the sensor size. as well as micro USB port to copy files and for charging. C5 Pro supports microSD cards up to 128GB, class 10 (U1) is recommended. I would recommend U3 for 4k recordings. On the backside of Andoer C5 Pro you will find a large 2″ live-view LCD display for framing and playback. The included, removable 950 mAh Li-ion battery has the same size & shape as Git2 and SJCAM SJ4000 & SJ5000 series cameras. 950mAh seem a bit small for 4K recording, 80 min. are stated for 4K 30fps recording, lets seen in a test if it stands up to this. Andoer C5 Pro is available in black, white & silver. Andoer C5 comes with a huge pack of accessories including an underwater case, which is 30m waterproof. A second door with openings (for better audio recording) and a frame mount with 1/4″ tripod threads on top and bottom which you can also use with the included clip. You also get a Bicycle Mount, J-shaped Mount Base, 2x adhesive mounts, 3x Switch Support, Tripod adapters, Bracket, Bandage, Ribbons, Wire Rope, Adhesive Tape, Cleaning Cloth & English User Manual. 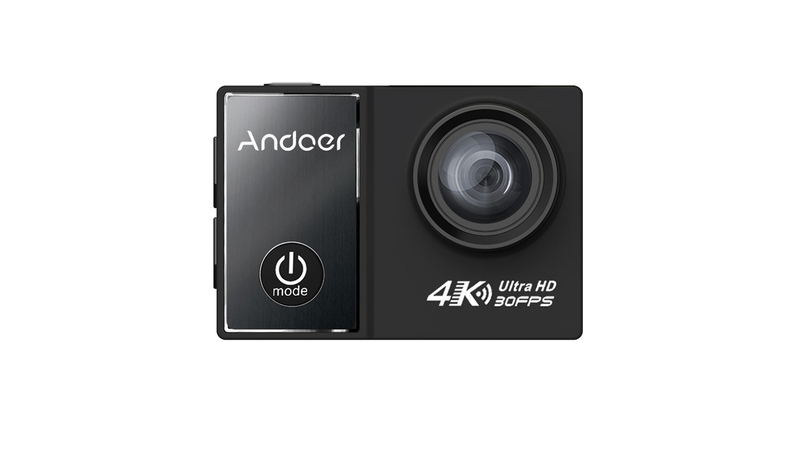 Be careful as there is another Andoer 4K camera available which offers interpolated 4K. be sure to check it is Andoer C5 Pro, the only Andoer camera which offers real 4K! On the front side of the camera you will find the Power/Mode button, on top the Shutter / Select button labelled “OK”. Next to it is a LED indicating wifi connection. On one side you will find the ports (microSD card slot, microHDMI & micro USB port), on the other side are up and down buttons which are used to navigate the menu. Attention! One graphic of the cameras shows that the up-button is also used to turn on the wifi but I couldn’t manage to do it. Instead you can turn on & off audio recording which is indicated by a white (on) or orange (off) microphone icon on the screen. On the backside, left of the large 2″ LCD screen, you can find two LEDs indicating recording or charging. Andoer C5 Pro comes with a 950 mAh battery which has the same size and shape as SJCAM 4000 & 5000 series batteries as well as the battery used in GitUp Git2. I tested using a SJCAM battery and it worked. The camera doesn’t come with a charger, but you can charge the battery inside the camera. A SJCAM charger with battery is available for 10.99 USD. Andoer C5 Pro powers up in video mode and you can cycle the modes the using the modes: Video – Photo – Video Library – Photo Library – Settings; using the mode button on the front. Video mode is indicated with the camera icon on the top left of the screen. Additionally the selected resolution, aspect ratio, frame rate and video quality are display. On the top right you will find a microphone icon indication if audio is recorded. When turned off it switches from white to orange. Next to it you will find the battery status. On the bottom date & time are displayed as well as free storage on your micro SD card. You can switch PAL / NTCS at the menu option “TV mode”. 24p is not available. Bit rate is about 70 Mb/s in 4K with 30fps and 35 Mb/s in 1080p with 60fps . As 12 MP is the sensor size, larger resolutions (16 & 14 MP) are upscaled / interpolated. can be set to S.Fine (Super Fine), Fine & Normal and it changes the bit rate. Whereas S.Fine reflects 70 Mb/s in 4K, Fine equals 56 Mb/s and Normal 42 MB/s. similar to video quality S.Fine, Fine & Normal are available. You can choose if the camera powers up in video mode (“Record Mode”) or Photo Mode. This feature only works up to 1080p resolution and max. 60 fps. That is similar to other action cameras as more sensor space is required to stabilize the image which is not possible in 4K. Sony FDR-X3000 is the only one to offer image stabilization in 4K, which is furthermore an optical stabilization. GoPro Hero5‘s EIS is also only available up to 1080p 60fps, whereas YI 4K offers EIS in 2.7K mode. Off / Low / Medium / High – your camera will start recording when motion is detected. You have to stop recording manually. OFF/ 1/30s / 1s / 2s / 5s / 10s / 30s / 60s are the available selections. That’s nice to have for night shots and low light photos. ON / OFF – besides my selected 4K resolution, the camera also records a small 768×432 video. You can select Date, Time and Date & Time to be displayed in the video or turned off. Same selections as in video stamp are available. Nice that you can choose individually for photo and video. You can set the interval to: 1s/2s/5s/10s/30s/60s and a video file is automatically created. OFF / 1 Min. / 2 Min. / 3 Min. / 5 Min. – that is the length of one clip. In loop recording the oldest file will be overwritten once your SD card is full. This mode is meant to be for dash cam mode, when you want to use your camera as DVR. OFF / 2s / 3s / 5s / 10s / 30s / 60s are the available selections. 3 / 5 / 10 pictures are taken within one second on triggering. Similar do time-lapse video you can set the interval to: 3s/5s/10s/30s/60s and this time the individual photos are saved. You can change the field of view from 170° to 140° and 90°. You have the option of Time-Lapse recording, as well as Loop Recording (where the oldest files are overwritten), when you use it as dash camera. As mentioned earlier here you can select between NTCS and PAL. You can select 50 Hz, 60 Hz or auto. As different power frequency is used in America and Europe choosing the wrong selection may cause flickering of artificial light. You can choose if you want camera information displayed on the screen or just the live view image. Off / 3m / 5m / 10m – based on the selection the camera will power down when in standby. Off / 30s / 1m / 3m / 5m – for power saving you can select a time after which the screen turns off. You can select if you want the status LED to be lit up or not. The Status LED is on the backside of the camera. same for the wifi LED on top of the camera. As there is no LED facing forward you won’t get reflections anyway. You can select on / off – currently I’m not sure if it relates to HDMI and/or A/V out via USB. Here you can switch on / off the beep sound when pressing the buttons. Basically it is a nice idea to manually control the audio. You can select from 50% up to 100% or off. Since you don’t have a visual audio level display it is hard to make a selection. At least when it is very loud you can switch down to 50%. You can select Strong / Normal or Soft. Auto / Incandescent / D4000 / D5000 / Daylight / Cloudy / D9000 / D10000 / Flash / Fluorescent / Water / Outdoor – That are way more pre-settings than most other cameras offer and give you the ability to really fine tune the image without too much color correction in post production. Great that there is a “Water Mode”, I have not tested it so far, but I guess it will simulate a red filter. If the selections are not clear for you, leave it in auto mode. You also have the option to manually correct exposure: +- 2EV (0.33 EV steps). Normal / Flash / Night / Sports / Landscape / Portrait / Sunset – not quite sure about the result of these settings, maybe a combination of a preset mix of ISO / white balance / shutter or a special filter – I have to do some more tests. Nice to have manual ISO control, especially in combination with long time exposure. You can choose: Auto / 100 / 200 / 400 / 800 / 1600. You can choose Center / Multi / Spot, where exposure is measured. Here you can set time & date. I noticed that after connecting camera and my smartphone the time & date was automatically set on the camera according to my phone. You can choose how the date should be displayed. That’s important if you use it in the date stamp. Available Languages are: English, Chinese, Russian, German, Italian, French, Korean, Japanese, Portuguese, Spanish, Arabic, Polish, Indonesian, D Currently I’m not sure where to get updates. utch and Swedish. Here you can switch wifi on & off. According to the manual it should be possible with the up-button on the side of the camera as well, but it didn’t work for me. When turned on the LED next to the shutter is lit and an icon is displayed on screen. … as well as wifi password. Standard password is 1234567890. Here you can format the inserted microSD card. Here you can go back to factory settings. ATTENTION! the selection is 0 or x. x is accepting an the camera will go back to factory settings! That’s you current firmware version – 1.06 was the one installed when I got the camera. Currently I’m not sure where to get updates, I’ll post them as soon as there are new versions available. If you received Firmware 1.05, please contact your reseller! It can’t be updated to 1.06 so your cam will be exchanged. The iOS app is called HDKCam, the Android version has a different name. I’ll post the screenshots soon. Look for the camera’s wifi with your smartphone. You can change the name in the menu (WiFi SSID) standard name is Action Cam followed by a number code. The standard password is 1234567890, but can be changed in the menu as well. 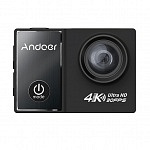 Compared to other native 4K action cameras Andoer C5 seems to be a bargain. You can compare all specs in my article “Best 4K Action Camera“, here’s a direct comparison to the competitors. Let’s start with the higher priced cameras GoPro Hero5, YI 4K and SJ7 Star. GoPro Hero5 black: Hero5 is packed with a lot of features C5 doesn’t have: Waterproof without case, Touch Screen, Voice Control, GPS recording, App with more features, better sensor and chip… On the other hand Andoer C5 is almost a quarter of GoPro’s price and remember the sensor is the same as in Hero4 black! YI 4K Action Camera: Yi is almost double the price but also got more to offer. A larger touch screen, better sensor & chip, more app features,… but again Andoer C5 is almost half the price. SJCAM SJ7: The price is closer to C5 but there’s still a gap. But this time the sensor and chip are the same. So the major difference is the touch screen with SJ7 Star. Compared to the cameras above Andoer C5 offers less features at a way lower price, so you have to decide if you need them and are willing to pay the extra price. 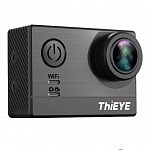 The direct competitors at a similar price level are ThiEYE T5, EKEN H8 Plus and the new Firefly 8S. They share the same sensor and same chip, therefore the smaller details are important. ThiEYE T5: T5 comes no accessories included. But it has Bluetooth for an optional remote controller. The App offers hardly any settings to choose from, just the basics. Compared to ThiEYE T5 Andoer C5 offers a slightly lower bit rate. The newer version of Thieye T5 offers mic-in via 2.5mm port. 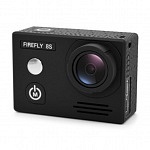 Firefly 8S: This camera is available in 2 versions: One with 170° wide angle lens and one with a 90° non-distortion lens. There are a lot of accessories included and it is equipped with Bluetooth for remote controller and mini USB which supports external microphone and A/V out. Image stabilisation is really good, it’s even better than on YI 4K. Compared to other native 4K action cameras the Andoer C5 Pro seems to be a bargain. The YI 4K action camera is priced higher, but also offers a touch screen. SJCAM SJ7 Star is a little cheaper than YI 4K, but there is still a huge price gap. The main competitor might be the EKEN H8 Plus, which offers a similar specs and price. 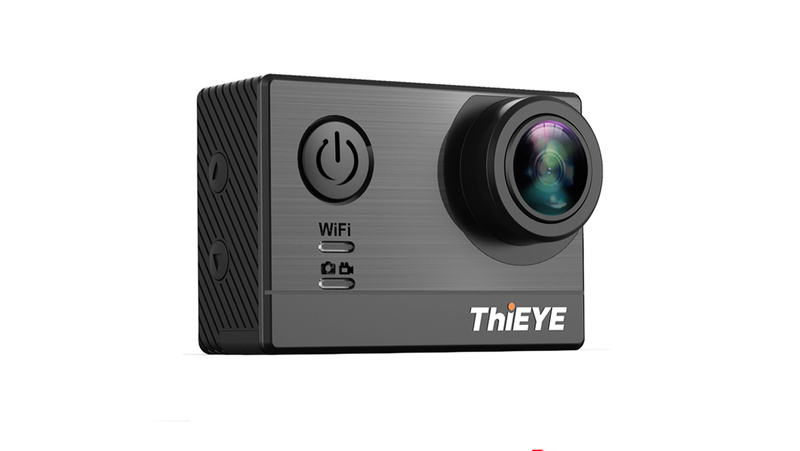 Most similar camera is THIeye T5 with about the same specs. If you don’t need touch screen and some settings features this is a great native 4K camera. Great price / performance ratio! Native 4K video resolution & 120fps in 1080p. Comes with lots of accessories. No remote control and no external microphone available. No direct tripod mount on camera.